I was hoping that the June Fresh From The Oven challenge would be up before I left work on the 1st of the month so that I could get it made on the first weekend and blog it the first Monday. This however did not happen, which in a way was a blessing as we had a luncheon at our house on the Sunday and the weekend was spent preparing for it, and then enjoying the party well into the night. Our host for this month is a Slice Of My Lyfe and the challenge she set was for us to make Pita bread. I nearly made these in December in preparation for my chance to host the FFTO challenge, and something made me change my mind at the last minute. So I was really excited to see that the challenge had been set. Given that it is winter in the Western Cape, which means rain and cold weather, I decided to make my dough in my bread maker so that the dough’s first rise would be perfect. I also put the heater on to ensure that the kitchen was warm enough for the second rise. These were therefore very easy to make, and I would do so again. They are very impressive all puffed up. I must say that I wanted to make felafel to go with the pita’s but that did not work out as planned. Next ›I Love My Country! So delicious, Tandy!! It was so nice to see you on Sunday! I am missing you – I did a Food Quiz, yesterday!? Lovely looking pitas. Thanks for participating and thanks for the mention! Beautiful pitas! I’m excited to see what you have in store for us next month! These look perfect. Thank you for taking part this month. Oh my gosh, your pita bread is simply beautiful! So light, fluffy–I can just imagine it dipped in hummus…or just eaten plain! They puffed up so beautifully. I used to go to a restaurant that would bring a basket of them straight out of the oven to your table. They would disappear in an instant. You are a genius. I would never even think to try pita bread Tandy. I’ve always wanted to try and bake my own pita bread, as they are not available in Taiwan. These look absolutely gorgeous! I’ve bookmarked it as a MUST-try! Thanks for sharing this recipe and hope you are staying dry and warm! Fresh baked pita bread is infinitely better than anything you can buy in stores! These look awesome! Those look delicious! Sorry to be a pain, but how do I make them without a bread machine? Add all the ingredients to a bowl and mix? great 🙂 Which reader do you use? I wish I’d seen this challenge earlier – I love pita bread. Yours look perfect. the challenge only ends at the end of this month! Yes, but I don’t think I’ll be able to find the time to make and blog abou them! Wow! Very impressive, Tandy, they really did expand and look so much fresher and lovelier than what I’m relegated to purchase.. I’ve got to try it one day! these look wonderful, i also make pitas–but yours look a whole lot better. I sometimes use the woolies vegetarian patties as a substitute for falafal balls. these look wonderful, and i also make pita, but yours look better. I use the woolies veg patties as a falafal filler for my pita. 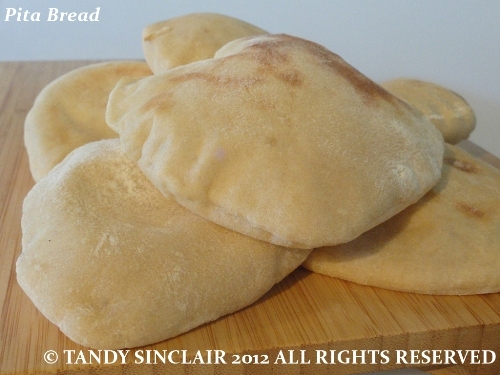 I love making pita breads, it is so rewarding. Yours look as good as they get. These look great. Sorry the falafeal didn’t work out. I love pita pockets with hummus and fresh salad but I always use shop bought. I don’t have a bread maker so I’ll have to stick to the old fashioned way of using elbow grease! Gorgeous, Tandy. There’s nothing quite as delightful as warm pita straight from the oven. Yum! They looks amazing. Like Roger I love pita but have never thought to make it. And with the bread machine…all so much easier! This was one of my favourite FFTOs to date. I loved how they puffed up in the oven …and how easy they were to make. Interesting to see your recipe using a breadmaker.